A frequently visited post in this blog is the one discussing the computation of the twenty (20%) discount of senior citizens that the “Expanded Senior Citizens Act of 2010″ (R.A. No. 9994) grants to Filipinos aged sixty (60) years old and above. In my said blog post, I presented how the correct deduction of 28.57% on the cost of goods and services subject to 12% value-added tax (VAT) is arrived at. I have also posted about an unfortunate incident that happened when I asked for a straight 20% discount to be applied on my jeepney fare to which senior citizens like me are entitled to. From the above-quoted provision of the law, the tricycle, a common mode of passenger transport in the country, is clearly missing. I do not know if our legislators intentionally did not include tricycle fare as among those subject to the 20% discount privilege granted to senior citizens. It could be that they just missed to include this comparably expensive mode of people transport. Anyway, whether they missed it or not, the Marikina City government had a way of granting discount on the tricycle fares of senior citizens. The Marikina City Sixth Council passed Ordinance No. 011, Series of 2013 and our City Mayor approved it on 25 March 2013. The ordinance prescribes an increase in the fare of passengers riding the authorized tricycles in the city. The minimum fare for a 1-kilometer distance was increased from Eight (₱8.00) to Nine (₱9.00) Pesos per person and the fare for a special trip from a tricycle terminal with 1 to 2 passengers for the same distance was also increased from Eighteen (₱18.00) to Twenty (₱20.00) Pesos. The fare for distance travelled in excess of one (1 km) kilometer remains at One (₱1.00) Peso per passenger per kilometer. As sort of consolation, senior citizens and elementary students are granted discounts on the minimum fares in the amount of ₱2.00 while ₱1.00 discount is granted to high school and college students. Children aged 3 to 5 years old will be charged ₱3.00 per ride. 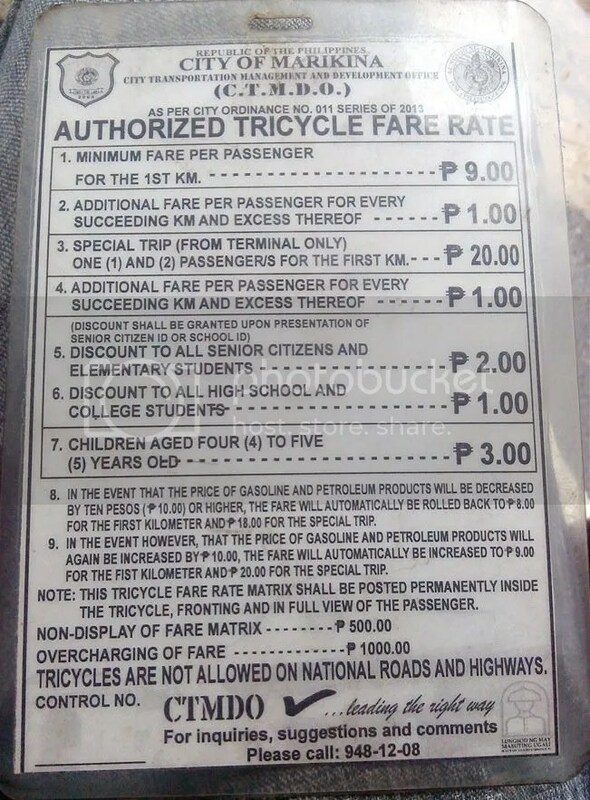 Should the residents of our city be happy for these mandated fares despite knowing that other cities and towns still have minimum ₱8.00 per passenger and ₱16.00 minimum fare for special trip on their authorized tricycles?